The story is definitely back. Businesses used to have eyes only for data. But entrepreneurs and marketers are now rediscovering and benefiting from the power of storytelling. 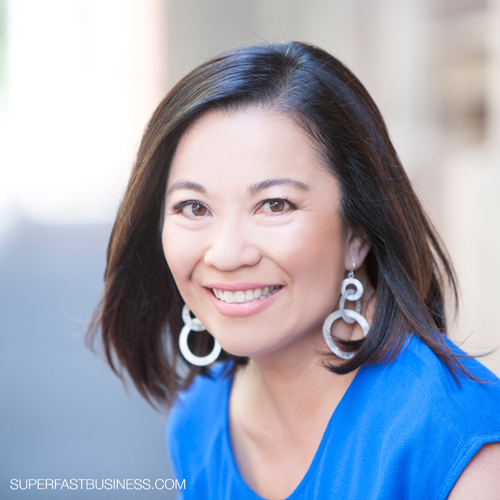 In this episode, special guest and expert storyteller Valerie Khoo offers vital tips that you can use to breathe life into your stories—and your business. 09:41 – Should you show vulnerability? 15:51 – What’s your passion story? James: James Schramko here, welcome back to SuperFastBusiness.com. Today, we are delving into the world of storytelling, so I’ve invited Valerie Khoo from WritersCentre.com.au to come and talk to us about story. Welcome, Valerie. Valerie: Great to be here, James. James: We got to catch up a few times now, but I heard about you well before I ever met you, and that is because you are quite the expert when it comes to storytelling. Valerie: (Laughs) A little bit, yes. James: Everywhere I turn; it seems that story is popping up. I just went to California, to a 3-day mastermind with very high-level marketers, and we were talking about stories. They were predominantly copywriters, and there was also a documentary maker. And everyone was talking about how important it is to set up the story nicely, how you have to… There were different views on how you actually define story, and there was even a fantastic presentation on why the hero’s journey is great for entertainment, but there’s better story frameworks to use for selling. So that was fun. But I think by far the most impactful thing was the documentary stuff, and that was showing how we can use it in videos. But the story theme for marketers seems to be very popular. Can you imagine why that might be? Valerie: I think that people are rediscovering, RE-discovering storytelling. I think that storytelling used to be really common, maybe 20 years ago and beyond. But I think what happened is that over the last… well, you know, in the technological age really, where it’s been so easy to put up a PowerPoint and put up a pie chart on there and hope that that will do the talking. Or you put a whole bunch of data up there. I’m sure you’ve seen those PowerPoint presentations where they stand in front and they say, “I know you can’t read this from where you’re sitting, but…” And they start to explain what the data that’s up on the slide. And what’s happened is that technology has enabled us to take data and slice and dice it any way we can, do any kind of permutation of a pie chart or graph or whatever, because we’ve been drummed into us that data is king, and that you need to make decisions on your numbers, and that is definitely true. That is definitely important. But what happened when we got obsessed with the Excel spreadsheets, you know, we do our Melbourne Cup sweep on our Excel spreadsheets, we do our footy tipping on Excel spreadsheets, some people actually write their stories on Excel spreadsheets. What happened is that the story got lost somewhere along the way, in the corporate world anyway, in the business world, because we became obsessed with our bright shiny objects and our technological tools. Storytelling is still alive and well, in books, obviously, in the world of the arts, in movies, all that kind of thing. But it waned a little bit in the world of business. And I think the business world kind of woke up to themselves and realized that this isn’t working, we need to harness the power of storytelling so that we can actually engage the people that we’re trying to reach, that we can actually touch them. Or so that we can actually change behavior. Because that’s not to say that data is not important. It is important. I used to be an accountant. Numbers are important. But it’s the story framing that data that is actually what most people are going to connect with. So I think it’s a rediscovery of storytelling in business, actually, James. James: Yeah, I was reading a book that was published in about 1931 when I was flying over there and it was The Robert Collier Letter Book. And it had plenty of storytelling in the advertisements back at that time. So I think that some of the greatest advertisements have had stories told about, especially the origins of the materials and how finely-crafted things were, and it actually can build value in the product. Does one framework fit all? Do you think that the same story framework should be used for entertainment versus selling? And do you use just the one for your different stories that must be told, or do you diversify? Valerie: I think it depends on what your goal is. Everyone’s heard of the hero’s journey, where the protagonist in your story goes through these 12 steps that Joseph Conrad (sic) laid out. And his theory is that everyone goes through these, every story goes through these 12 steps, and your hero goes through these 12 steps. And you, as a reader or viewer or listener or whatever, you remain engaged with the story all the way to the end because you want to cheer your hero on and you want to know what happens. But of course, you know, stories can be told in a much shorter fashion than having to go through 12 steps. There’s the famous quote by Hemingway. He was challenged in a bar, and someone said to him, “I bet you can’t write a story in six words.” And he famously replied, “For sale, baby shoes, never worn.” So you know, that in itself speaks volumes if you actually think about what those six words are saying. So you don’t necessarily have to go through the same frameworks all the time. You just need to determine what your goal is and ensure that your story helps you achieve that goal. James: Yeah, that’s a great point about not having to be long. Was it Joseph Campbell, The Hero’s Journey? Valerie: Joseph Campbell, yes, that’s it. James: That’s a nice tone. OK, so if we want to sell, how do we use story for that? Valerie: I think you need to paint a picture. You need to tell the story to your audience, your prospective customer, of what is possible. There’s that, and you can tell it in a variety of ways. You can tell it where they’re the hero of the story, or you can tell it where you have used the product and it’s changed your life. You can tell it where a customer has used the product or service or whatever, and it’s changed their life. So really, it’s a story about transformation as a result of using that product or service. I think that one of the things that I used to do, I remember I moved house once and I wanted to get rid of a whole heap of furniture, because it just wasn’t going to suit the next house that I was going in. And I wasn’t really big on eBay at the time, but a friend of mine said, she was really into eBay, she said, “You’ve got to get on eBay, just sell the stuff.” And I thought, look, I’ll give it a go, it’s a lot easier than me trying to take it to the tipper or anything, if someone wants to come and pick up stuff, that’s great. So I put a whole heap of furniture on eBay, and I just couldn’t help myself because I suppose I’m a natural storyteller, and I told a story for every single piece of furniture, even the cat scratching post and the clothes rack and the outdoor furniture. And my friend was reading me, and she said, “I cannot believe the prices you’re getting.” Because in all but one case, I got the same price that I paid for it or more. And even my outdoor furniture was from Bunnings, it was 2 years old, and yet somebody was driving 2 hours to buy it. Because you know, I painted this picture of what was possible for them in terms of using the outdoor furniture. I didn’t just put the specs, I didn’t just say the height was this, it’s made out of stainless steel or anything like that, I’d say, “Imagine coming home after a hard day at work and sitting outside and dining al fresco with a glass of Pinot Grigio on your outdoor setting and letting your worries just wash away.” And I would go on a little bit, and I was selling boxing bags and things like that, but it’s showing people what’s possible through your story. James: Yeah, that’s funny. I’m not going to buy furniture from you, Valerie. James: I remember also doing it with a couch, once, because it had a little dog chew on the corner and I described that sorry day when the little puppy did something it shouldn’t have done and left a little indelible reminder of its character. And people ask me, “What sort of dog was it?” and they bonded with this little puppy. And it’s the first thing they wanted to see when they came. But it was using that damaging admission technique that copywriters use where you highlight the flaws. James: And speaking of that, I was told just recently that when Superman came out, that it was an unsuccessful story until they added in the kryptonite. How important is it to have vulnerabilities and to make sure that our character has got a little bit of a flaw that we can bond with? Valerie: I think it’s important to be real. And what’s real to one person is different to what’s real to another person. So it’s important to be real and authentic. But what I really, really think is important is that I see a lot of entrepreneurs, particularly online entrepreneurs, they had a tragedy. So they have a tragedy story. And I see it a lot. And if that’s true for you, that’s fine. Brendon Burchard will say he had a terrible accident when he was very young and he almost died and it changed his life. Lewis Howes will say that he had some kind of accident when he was a pro athlete and then he had to lie on his sister’s couch for a year before he turned his life around. And I just want to emphasize: people, you don’t need a tragedy in your life to be successful. James: Thank goodness for that. Valerie: Oh, it drives me bonkers. James: Honestly, I don’t know how people can retell those stories over and over again with a straight face. James: Especially the fake tears. Don’t know how many times I’ve heard that Brendon car crash story, but it’s really just like, get over it, dude. James: It’s not really helping him move forward if he keeps regurgitating it. James: In a synthetic way. Valerie. Yeah. 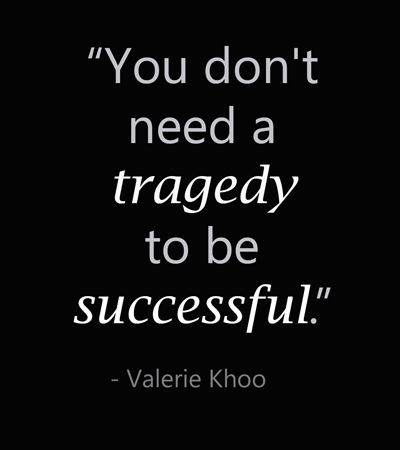 And you don’t need a tragedy to be successful. It’s OK if you’ve had a normal, boring life. Valerie: Yeah, absolutely. I think it’s important to be real, but I don’t want people to think that they need to follow some of the online entrepreneurs out there. James: Well I had something happen to me just last week that was quite traumatic, but I decided not to share it on Facebook. Instead, I just talked about it in my own community because I had to explain why I wanted to move the date back for a webinar. And I noticed that it created a tremendous amount of rapport and bonding and empathy. And it’s a real thing that happened, people recognize that, and they also look for the lessons and how it could be used to protect you from having situations in the future. Not unlike the hero’s journey, where you come back to the campfire and you share your amazing adventure and all the lessons you learned along the way and how you changed as a person and how everyone else can benefit from this new knowledge. So it was a really fascinating thing to observe. Valerie: I think what’s important there is that sometimes when we’re part of… stories get told and they get retold. And I know you’re not guilty of this. I know you had this particular incident that just occurred to you, but you certainly don’t do this. But I see a lot of people who are in forums, who are in sort of “private” groups. But even though you need to be invited to be in the group, there’s still other people in the group who you don’t necessarily know. And you don’t know who they know, or who they’re sharing your story with. So I think it’s also important to be careful in forums and community groups and that sort of thing, the kind of stories that you are putting out there, because they get retold, and if you’re, say, constantly telling stories where you’re constantly at odds with the world or you’re always getting angry at a supplier or you’re always just complaining and whinging or whining, that’s the image that you’re putting out there in the world. James: That’s a good point. And also if you’re in one of those little smarty pants groups, where you’re telling everyone how you’re stitching up customers and selling them high-priced products and all of that, people will get very upset if they’re a customer and they find out about that. James: And you’re right, I’m definitely not either of those. Now that’s why I didn’t go to Facebook, actually, I really didn’t want sympathy and I didn’t want anyone to think that I’m a “woe is me.” It was an unfortunate situation but I dealt with it very well, and really it was just nice to have a small group of friends to share it with, just to help me move through it very quickly. And in case a listener’s wondering about it, I talked about it inside SuperFastBusiness membership, and that’s where it stays. Now, when it comes to story, I’ve heard there are different elements of it. We hear a lot about the plot, about the conflict and the journey and all of that, but there are other elements as well, aside from the characters. I guess we’ve sort of touched on the purpose, I mentioned specifically to sell, but there are also other things, like where the story takes place and other elements. What can you add to that thought line? Valerie: I think it depends again on what you want to achieve. I think that things like place or description or dialogue or anything like that adds value to the story, then definitely include it. So I think that’s really your marker, does it add value to the story, is my reader or listener or viewer, whoever, going to enjoy it more? Does it actually matter where it took place? You know, some stories it doesn’t matter, because it’s everything else that happens that brings the story to life. So I think yeah, it depends is the short answer on that one. James: Now, I read your great book, which was about power stories. Do you mind sharing with us which are the essential stories that we should be considering in terms of our inventory? Valerie: Sure. I think that one that is vital, and I’m surprised at how often it’s not told, is your passion story. Now, there are some people who know their passion story, and they tell it, and that’s fantastic. And what I mean by your passion story is, what are you passionate about? What makes you get out of bed every day? What is it that lights your fire and makes you excited to do, particularly if this is in a business context? James: You know what I’m passionate about? James: Oh, you got it. I just wanted to make sure you knew my story. (Laughs) Every listener’s chuckling now because I never stop talking about surfing. It’s amazing how my customers want me to surf. They’re excited for me about it, they love hearing about it, and they actually aspire to having their business running well enough where they could do something that they like to do every day as well. So I’m glad you touched on this passion story. Valerie: Well, you have hit the nail on the head when you say that your customers love hearing, they want you to surf. Because what happens with your passion story, whatever it is, everyone’s got different passions, and that’s fine. What happens with your passion story is that passion, when you’re excited about something, it’s actually infectious. People can feel it, they know, they can see it in your eyes when you’re excited about something. They know that you’re bringing something to the table that’s not just about the bottom line, or about dollars, or whatever. You’re excited about something and people want you to be happy. They want to cheer you on, they want you to achieve your daily surfing routine, you know, or whatever it is that you do. So I think that sharing your passion story is vital. And it’s surprising the number of people who don’t do it, either because they’ve forgotten, they haven’t thought about it, because you know, you can get caught up with the daily grind, you can get caught up with your day-to-day. You kind of forgot the stuff that excites you. So you don’t talk about it, obviously. And I encourage people to give it some serious consideration. Think about why, what gets you excited or what gets you out of bed every day or what drives you in your business. But also, what’s weird is that there are people who know what they’re passionate about, but for whatever reason, they’ve never actually articulated this to even their spouse, or to their suppliers or to their employees. And what I say to those people is, wouldn’t it be great if you did share your passion story? Particularly if you were passionate about a particular area of your business, and people can see why, you know, you really have a real why of why you’re passionate about that area of your business. Your employees, your staff, your team, your suppliers, can then get behind you, because they can see that there’s the genuine excitement and genuine passion for what it is that you want to achieve. So I encourage people that if you haven’t told it, haven’t told your passion story to someone, but you do know what it is, then absolutely, tell it. James: Right, so what other stories can we have? 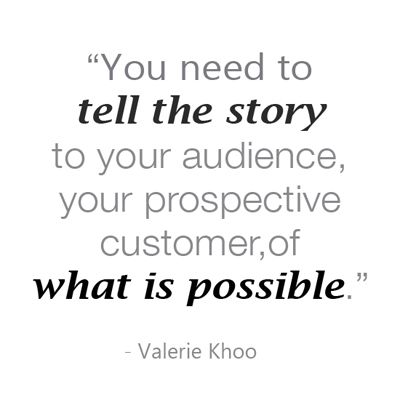 Valerie: I think that a great story, and a must story, is your customer story. And your customer story is more than a testimonial. Testimonials are fantastic, you should definitely have them, you know, and if people are sending you wonderful things that they’re saying about your work, then that’s great, but it’s not a story. It’s still good, you can have a testimonial page, but I would encourage people to find out the true customer story. And at the most basic level, what that is is, if you can imagine, three parts. Before, during, and after. Pretty simple. So what was their life like before they started working with you, or using your product or service, why they chose your particular product or service, you know, like what were they hoping to get out of it, and then after, which is what is the result? How did their life transform as a result of using your product or service? Very, very simple. But the biggest area that people fall down in this, because you can ask any business owner, they can say, “Oh yeah, I’ve got heaps of customer stories,” and they can rattle them off all out of their head. But it’s useless staying in your head. I mean it’s fine if you convert people one-on-one, but chances are a lot of business owners aren’t spending one-on-one time converting people. So you need to make sure that they’re documented somewhere, or told in a video, or explained in a podcast, whatever it is. But you need to get it out of your head and told in some kind of way. And even some business owners, they have thousands and thousands of customers; they can’t possibly even have all of those stories in their head. You need some kind of mechanism that can capture those stories efficiently and effectively so that you get a good, well-rounded story without having to put too much effort into finding it. So your customer story is vital. James: Right. So I’ve found one way to do that is I have a Google document where I encourage my successful customers to share their story, and then I turn that into a case study podcast. That’s been pretty effective. What other ways can we do it? Valerie: And what’s interesting is that sometimes I talk to groups of entrepreneurs, and there’s always a handful, and interestingly they’re usually women, who will say that they feel icky asking for the story, that they feel like it’s currying praise. You know, they just feel that it’s awkward, trying to get a case study out of someone. So my suggestion with that is to make it so that you are not personally asking for it, in fact. So what you need to do is, when someone, your customer, comes to the end point of, you know, they’ve completed your program, or they’ve used your product, they’ve done your service, whatever it is, you’ll now, obviously, at that point, and you need something to trigger, it can even be an automated system, particularly that’s useful if you’ve got thousands and thousands of customers, that triggers a feedback request. And it can be a really genuine feedback request saying, you know, “We always want to improve our products and services, we’d love your feedback on it, here’s a very short survey.” And your survey will ask questions like “How can we improve?” because it’s always really useful to find that out, but it will also ask something like, “What’s the best thing about your experience?” or the product or the service. And when you’re asking for the best thing, you’re going to get something good, right? And also a question like, “How did it transform your life?” Or “How did it help you achieve your goal?” whatever it is that’s appropriate for your product or service, so that people then explain it further then. And then ask, you know, “If you were recommending this product or service, or if you were recommending (insert the name of your business) to a friend, what would you say?” And that’s usually a more well-rounded response that’s not just to do with the product or service. And then the easy one, then this is the kicker, is are you happy for us to use your comments on our website or marketing materials? And bang! You’ve got yes or no, and obviously you need to respect people who say no. But heaps of people will say yes, and you’ve immediately almost got your before, during and after in a sense. So that almost 8 times out of 10 will give you enough stories. The 2 times out of 10, you probably need to delve a little bit further and ask them a few questions because they haven’t written enough. But still, that’s a pretty high struck rate. So I think a system that just collates the information makes it easy for everyone. James: Nice. Yes, I’ve got a Google document where I have successful students talk about what life was like before, what things did they apply, and what sort of results did they get, and how they prescribed someone else to get a similar result, and we turned that into a podcast. That’s very successful, that format and that’s just one way to do it. James: Yeah. And the story is good. I think a short definition of a story that I like is something happened to someone, or something along those lines. James: Feel free to use that Valerie. All right, we’ve talked a little bit about stories, we’ve talked especially about the business application, we’ve talked about the importance of having your passion story, about getting customer success stories. I know you’ve got seven power stories but I’m certainly not going to ask you for all of those. I think that our listener should definitely read your book. Tell us about the name of the book and where we’ll get it from. Valerie: The book is called “Power Stories: The 8 Stories You Must Tell to Build an Epic Business.” It’s available well in all good bookstores, but the easiest way is probably just to get it from Booktopia because they always have it in stock. James: Right. Yeah. So there’s eight stories. Sorry. I don’t know why I said seven. Seven is such a catchy number. Anyway, what’s the one most important point that we should know about stories? We’ve listened to this, we’re excited about the idea of it, we have some basics around some frameworks, and we’ve got other things we can go and research. But what’s the most important takeaway that we should keep in mind when it comes to stories? Valerie: That you’ve already got them under your nose, but you haven’t probably articulated them. Now you’re a good storyteller James, but not everyone is like you. It was interesting because through a lot of my life, because I’m into stories obviously, and possibly I hang around people who are into stories, I just thought people can tell stories. It’s just a normal part of human behavior. But some people need a little bit more help than others. It was actually not until I dated a guy who was just a hopeless storyteller, clearly it didn’t last, that I realized wow, there are some people who just don’t know how to tell stories. If some people are lacking confidence in their storytelling capabilities or are not sure the most effective way to structure their stories, then I would suggest that you just need to get them out of your head and write them down. One of the things that I provided in the book is a whole heap of templates that really ask you a series of questions, and by the time you fill in the blanks, your key stories are already documented. I think what happens is sometimes if you’re in the middle of converting your customer or you’re in the middle of trying to seal a deal or whatever, and you want to pull that story out but because you haven’t written it down or articulated it somewhere before, it’s not necessarily told or delivered in the most effective way, which kind of dilutes the effectiveness of the story. So I just encourage people that you’ve got your stories, you’ve got tons of stories in your business and in your life, but take that little bit of extra effort, whether you want to write it in a blog post, whether you want to write it in a journal, whether you want to write it just somewhere, or just tell it to somebody. Make sure that it’s articulated at some point because once you articulate it and you know it works, you can just pull it out again and again. James: Yeah. That’s such a good tip Valerie. I’m very lucky that you were able to come along and share some of your story insights. I think your published material is fantastic. I know you’re into podcasting and teaching people how to write stories. I imagine that’s what you do at WritersCentre.com.au. It’s also really nice that you’re in my own community. I enjoy exchanging some ideas with you here and there. So thanks so much for coming along and sharing. Valerie: My pleasure James. Now you should go off and surf. James: I think I might.